In 2012, 1.8 trillion display ads were paid for, but not seen. For advertisers looking for results, this is an unnecessary waste of effort and budget! 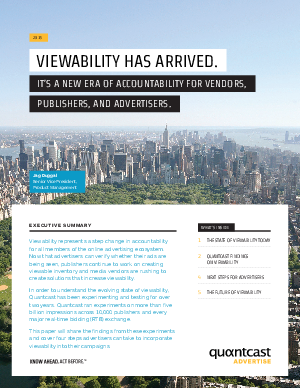 Thankfully the industry is rallying towards a viewability standard, signaling a new wave of accountability for publishers, advertisers and ad vendors. As advertisers embrace viewability, they can benefit from knowing that their ads are seen, eliminating waste, and increasing campaign accountability and effectiveness. We conducted our own research and found that viewability is becoming a reality for improved campaign performance.